shoots brah! 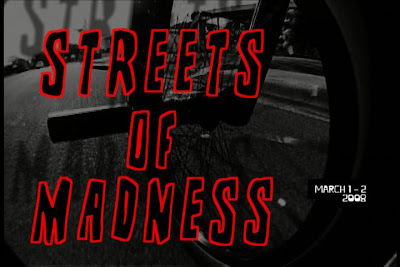 : Streets Of Madness Pt. III DVD's Are Here!! That's right folks! The DVD's just got finished and they will be available at BIKEFACTORY on Sunday April 18th. After we send a bunch out to sponsors of the event, there's not many left. There have been some requests for a copy to be sent out for guys on the mainland so those will be taken care of as well. Contact me if you have any questions. what's going on guys? I need one of those dvd's. it's the same up here. for some reason it's still snowing in April. Lame. Need to know what's going on down there. I'm missing out on good weather and curry katsu.